More in less: Esaote introduces the new Productivity-Oriented Platform, a further breakthrough in ultrasound imaging. Focused on the real diagnostic value, MyLab™Seven with eHD Technology and CrystaLine is an innovative ultrasound system able to deliver high-class performance and compact size in cardiac, vascular, womens' healthcare, point-of-care and general imaging applications. The Esaote CrystaLine represents the latest enhancement in Ultrasound image quality: brightness, clarity, purity and sharpness to increase Productivity, Efficiency and Value with optimal workflow and upgrading capability in all applications. Combined with the advanced eHD Technology, the Esaote CrystaLine represents your Imaging Solution particularly for difficult-to-scan patients: it helps increase your diagnostic confidence, achieve high performance, improve patient care and throughput. The wide 16:10 LCD monitor and large sized high-definition touch-screen reflect the main philosophy of the system: Productivity in Real-time, means better diagnosis in less time. 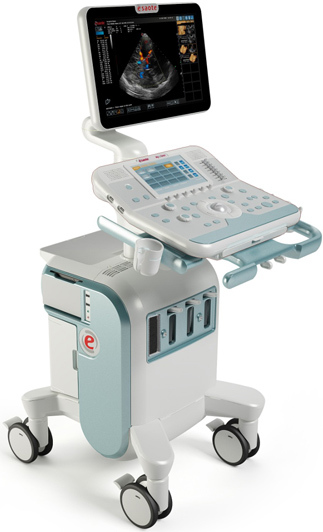 Click the button below to add the Esaote MyLab Seven Multipurpose ultrasound to your wish list.